The 23-year old world No 2 promised before the start that he would attack the course with his driver and try to glean as many birdies as possible to offset the inevitable bogeys. But he was never in position to do that and made just one - at the par three 13th - and hit just seven fairways in his worst opening round as a professional for more than five years as debutant Peter Lawrie carded a 74 that could easily have been four shots better. McIlroy also took the option not to face reporters after his round and instead made his comments to a USGA official in private, explaining that he simply could not get himself in position to score. Playing in the marquee afternoon group with world No 1 Luke Donald and No 3 Lee Westwood, few would have predicted that they would make just three birdies between them. Westwood had two in a three over 73 while Donald had none in a lacklustre 79. “I didn’t I got off to a decent start and then it’s just so tough here if you put yourself out of position at all,” said McIlroy, who bogeyd the first, fifth, seventh, ninth and 12th before making his only birdie of the day at the 13th. “It’s so tough to make your pars from there. 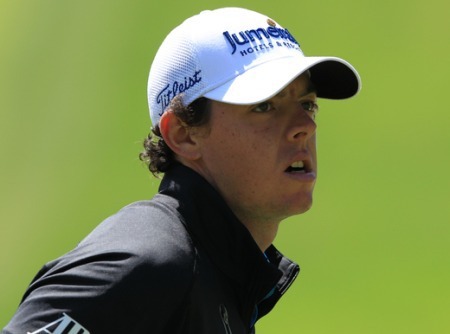 “Too many times I just was in the wrong position off the tee or with my second shot and it makes it very difficult. You know, when you’re trying to play catchup on this golf course it’s very hard. I was able to make one birdie out there today. I need to try to make more tomorrow and limit the mistakes. McIlroy needed a good finish to keep alive his hopes of retaining the title but instead bogeyed the 15th, 17th and 18th to finish the day tied for 109th in the 156 man field as 29-year old Michael Thompson hit a morning 66 to take a three stroke lead in his first major as a professional. Thompson birdied six of his last 12 holes to lead by two from Tiger Woods, Justin Rose, David Toms, Nick Watney and McDowell as just eight other players matched par. “The way I look at it is I’ve always kind of flown under the radar,” said Thompson. “Obviously, my name’s in the spotlight, but a lot of people don’t know who I am. And I’m totally okay with that because I’ve always been a player that just kind of hangs around. McDowell got off to a great start on the tougher front nine when he parred his first six holes and followed a bogey at the driveable seventh with a great par save at the eighth, where he pulled his tee shot well left but holed an 18 footer for his par. A bogey at the 12th left him one over par but he dug deep and finished in style with birdies at the 17th and 18th. After hitting 10 of 14 fairways and 13 greens, McDowell added: “It’s a nice start. And you want to get a little bit of momentum early this week if you can because if you let this golf course beat you up early in the week it will just continue to do that. Lawrie made an impressive US Open debut but still walked away disappointed with a four over 74. After a great par save from five feet at the ninth, he birdied the 10th and 11th from inside five feet to share second place briefly but then bogeyed the par-three 13th off a bunkered tee shot and played the remainder in five over par as conditions toughened considerably for the afternoon starters. One under par after his first nine holes, Lawrie overshot the 18th by a yard and bogeyed there before dropping futher shots at the first, second, fifth and sixth. He birdied the seventh to get back to three over par but bounded through the back of the par-three eighth off a fine tee shot and knew he was “dead”, scooting 20 feet past the pin with his attempted recovery from thick rough, finishing the day tied for 52nd. Graeme McDowell and Rory McIlroy are two of the best in the world but even the best have weaknesses and they were cruelly exposed by Pinehurst No 2 on Saturday.